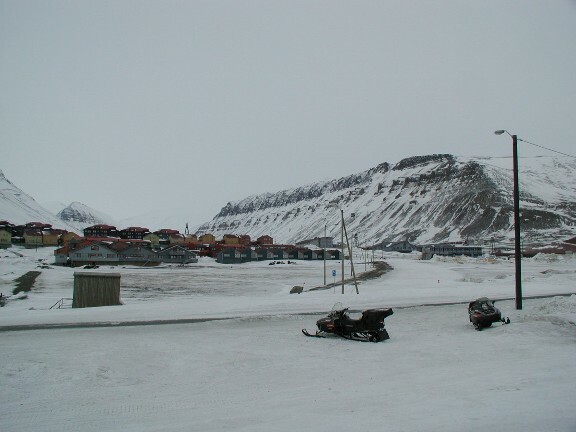 Longyearbyen, the largest community in the Svalbard archipelago, has a population of about 1100 people and about as many snowmobiles. Located in the Advent fjord at the entrance of the Advent valley, this community has an infrastructure fit for a much larger city. 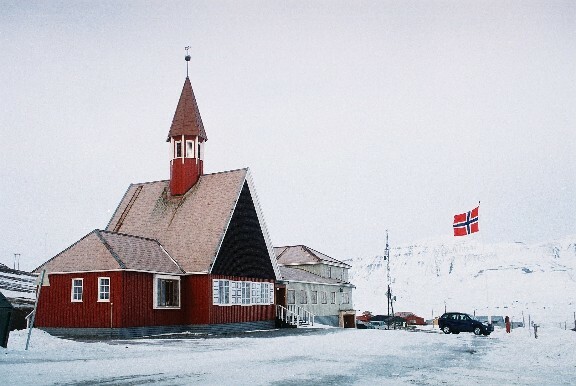 In the center of town you'll find the post office, bank, conference rooms, travel agencies, public library, cafes/restaurants, miners' bath, hospital, laundry, tourist information, supermarket, general stores, and the world's northernmost newspaper, Svalbardposten. There are various forms of lodging, from hostels to modern full-service hotels. Of course, there's nightlife too... During summer, most of the people you meet here will be tourists or young people working to accommodate the visitors. A very friendly and international atmosphere reigns. With fall, the miners and their families come back from the mainland to work in the coal mines through the dark portion of the year. 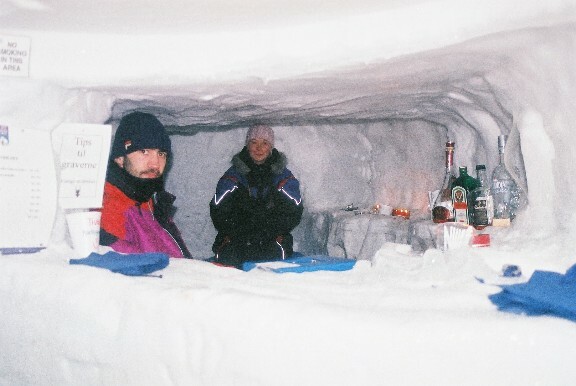 In the summer of 1995, the University Studies at Svalbard (UNIS) opened, so now you can even be a student here. 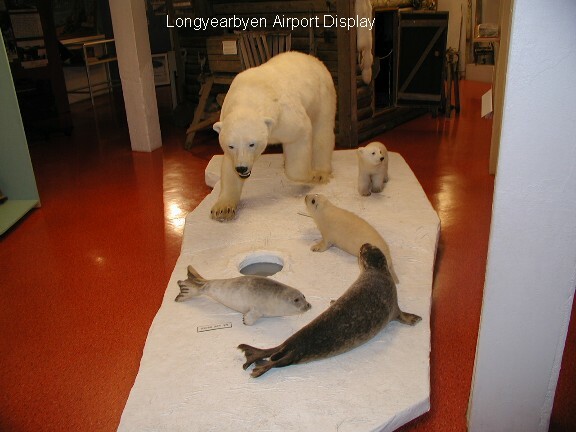 And, of course, Longyearbyen has its own international airport. 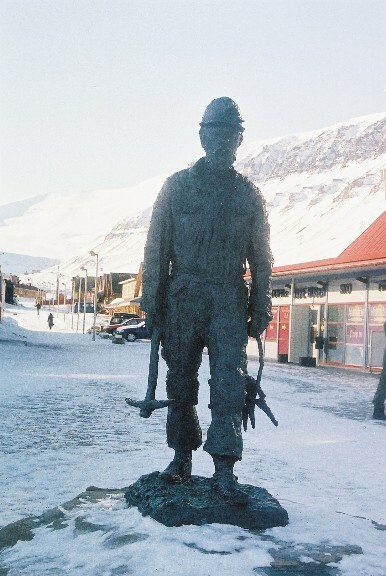 Longyearbyen's history is closely related to mining. 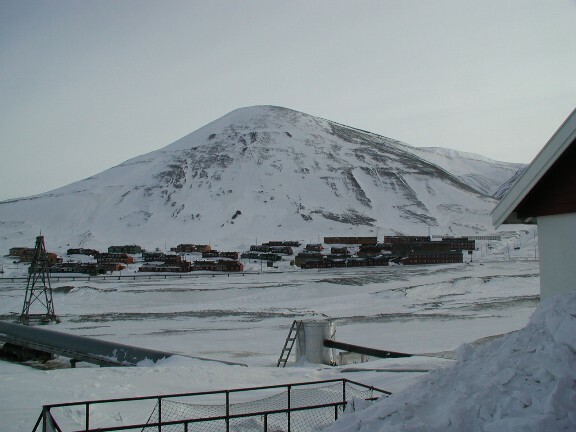 Longyearbyen is located next to Adventfjorden, where several mines were started. 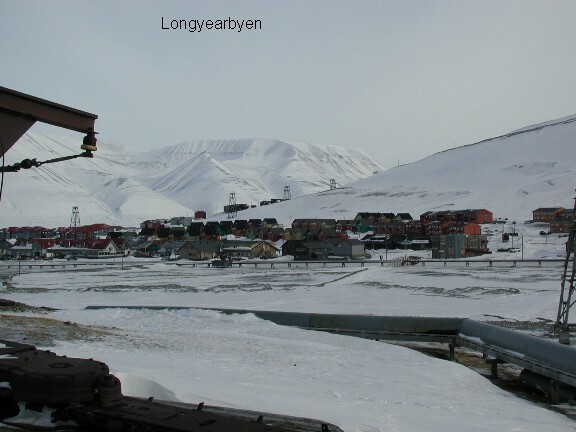 An American firm, Arctic Coal directed by John Munroe Longyear, started a coal mine at the current location in 1906, and called it Longyear City. In 1915 Arctic Coal sold the mine to a Norwegian company, Store Norske Spitzbergen kullkompani. 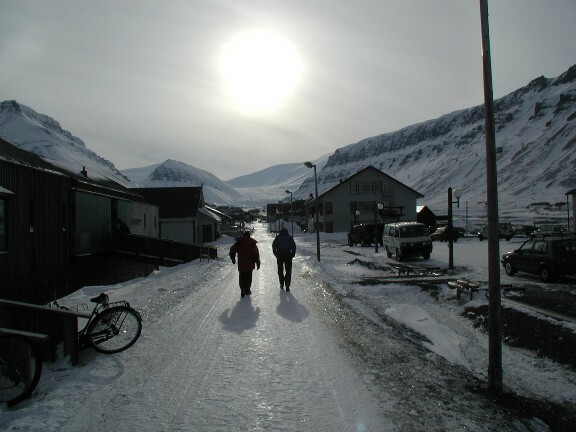 There are about 1600 inhabitants living in Longyearbyen, with the primary activity being tourism, and service-related fields. 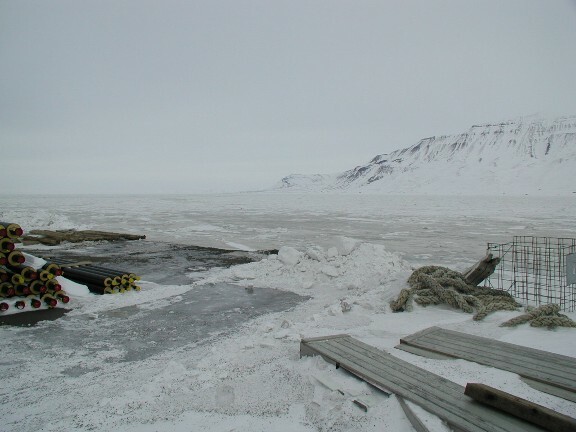 There are several scientific related enterprises, including UNIS - the University courses on Svalbard, an aurora research station, EISCAT - the European Scattering Radar, Svalsat - a satellite station for contacting satellites in polar orbits, run in cooperation with NASA, and several others. 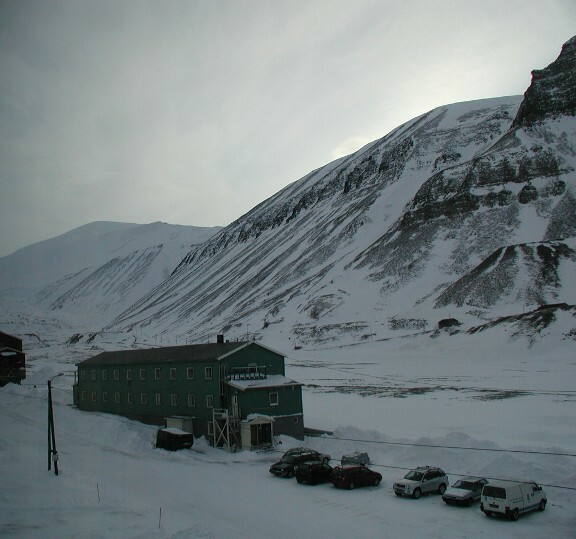 Live web cam pictures of the Longyearbyen. 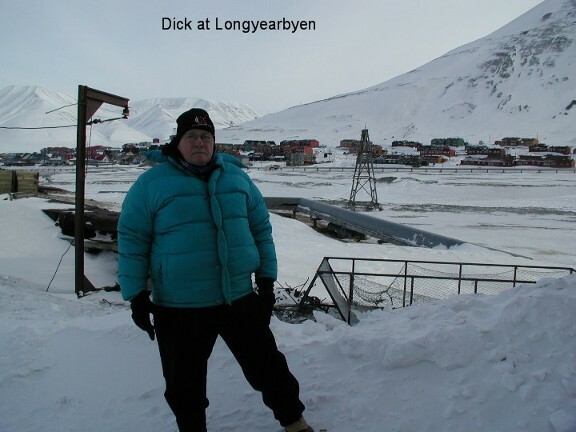 I flew into Longyearbyen from Oslo on April 7 on the same plane as Jeff Dyrek. In the next few days the remainder of the Global Expedition Adventures group, Randy Peeters, Ashok Patel, Richard Meng, Peter Baker and Van Glauby arrived. Randy and Van were to "ski the last degree" to the pole, and the rest of were to be stay the Barneo camp and the flown to pole in helicopters. All of us, except for Peter Baker stayed at a hostel, the Spitzbergen Guest House, which is about 2 miles from the center of town. We got a lot of exercise walking to and from town. 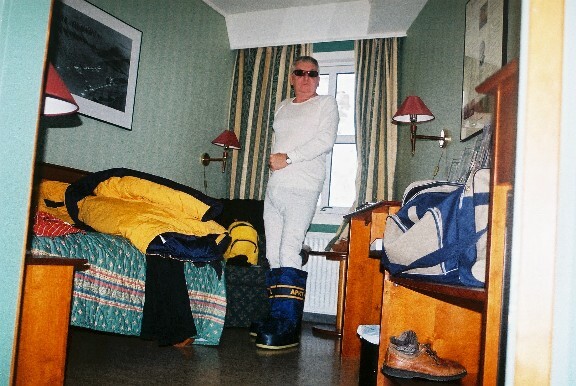 Peter stayed at the Spitzbergen Hotel, which had "ice bar ". While waiting in Longyearbyen we visited the museum, the church, went dog sledding, took a long snowmobile tour and visited an ice grotto. When the temperature doesn't get above zero, you are always dressed in your arctic gear. Most places have a area near the entryway, where you remove your boots and heavy outerwear. they provide slippers that can be used while in the establishment. More residences at the side of a river that runs in the brief summer months. One of the 5 Spitzbergen Guest House lodges were most of us stayed. Residences and snowmobiles, which are the primary mode of transportation for 8 months of the year. 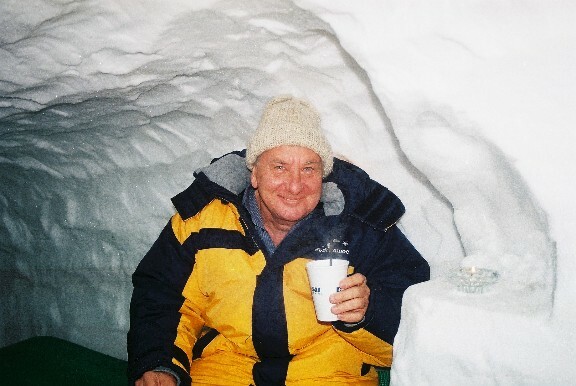 Peter having a drink in the "Ice Bar" of the Spitzbergen Hotel. This display is in the arrival luggage area of the small terminal. 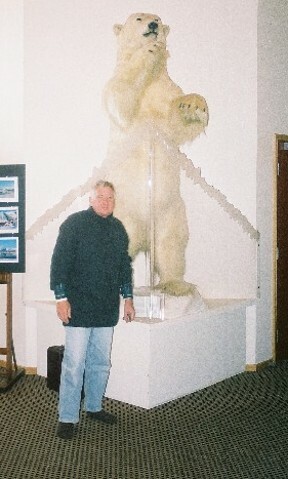 Peter with the mounted polar bear in the Radison hotel lobby.